The Rt. Rev. John McKee (Kee) Sloan, bishop of Alabama since 2012, has announced his plans to retired at the end of 2020 and has called for the election of a bishop coadjutor. Bp. Sloan, the 11th bishop of Alabama, announced his decision at the diocesan convention Feb. 9 at Camp McDowell. The full text of his address is here. 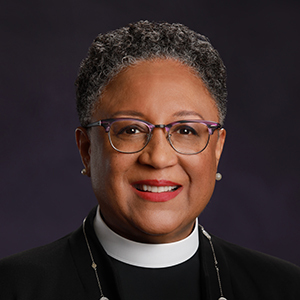 African-American woman elected bishop in W.Tenn. The fall 2018 edition of the Province IV newsletter, "Fourth Watch," is now available HERE. This is the last issue of the Provincial newsletter. 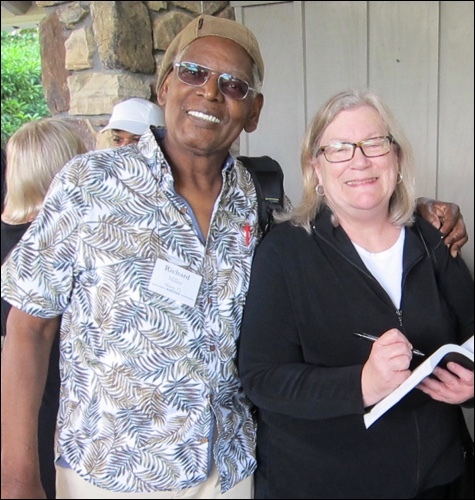 The Province IV Synod honored long-time General Convention deputy Anita George during its 2018 Synod June 8 at Kanuga. The Synod unanimously passed the attached Courtesy Resolution, available HERE. The updated Province IV Companion Dioceses directory is now available HERE. Province IV has awarded $20,000 in new ministry grants for 2017. The full story is here. The Spring edition of Province IV's newsletter, "Fourth Watch," has been published online and is available for download HERE. Here are the officers for Province IV, elected and commissioned at the 2018 Synod June 6-9. From left, The Rev. Cn. Frank Logue (Diocese of Georgia), clergy representative to Executive Council; the Rt. Rev. Scott Benhase (Georgia), Vice President; Canon Kathryn W. McCormick (Mississippi), President; Ms. Alice Freeman (North Carolina), lay representative to Executive Council; Ms. Tess Judge (East Carolina), Treasurer; and Mr. Mark Smith (Alabama), Secretary. 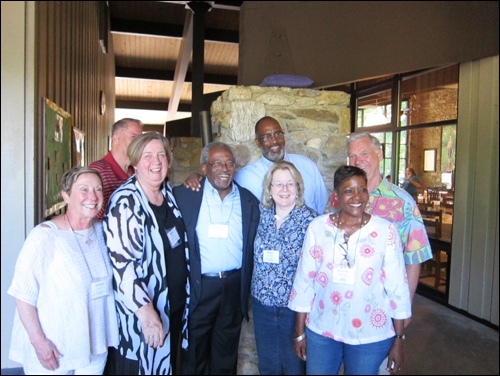 Episcopal Church Presiding Bishop Michael Curry is welcomed at Kanuga Conferences for the 2018 Province IV Synod. 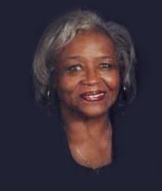 He, along with House of Deputies President Gay Jennings and General Convention Executive Officer Michael Barlowe, were to present an overview of General Convention later this summer in Austin, Texas. 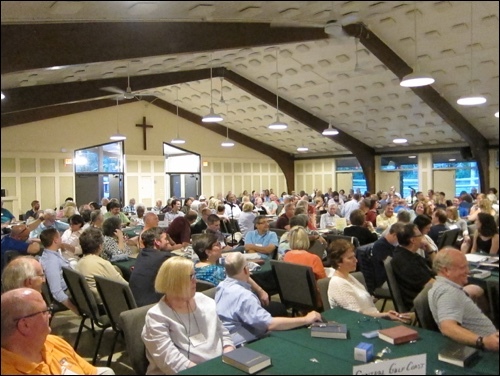 A record 244 men and women, clergy and lay, gathered at Kanuga Conferences June 6 to begin the 2018 Synod, the gathering of all deputies and bishops who will be attending the Episcopal Church's triennial gathering, General Convention, in Austin, Texas, beginning in July. 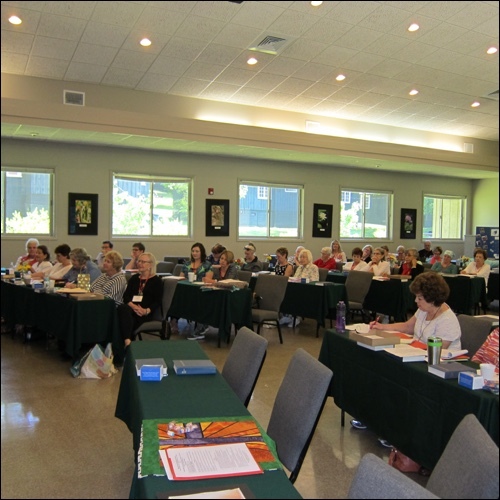 The ECW of Province IV held its annual retreat June 4-6 at Kanuga Conferences, near Hendersonville, N.C. The women welcomed the Rev. Dr. Sandra McCann, of the Dioceses of Atlanta and Tanzania, as the guest speaker and priest. The Rt. Rev. Brian Lee Cole was ordained and consecrated as the fifth bishop of the Episcopal Diocese of East Tennessee Dec. 2 at Church of the Ascension in Knoxville. Presiding Bishop Michael Curry, led the service as chief consecrator. Cole succeeds the Rt. Rev. George D. Young who served the diocese from 2011 to 2017. 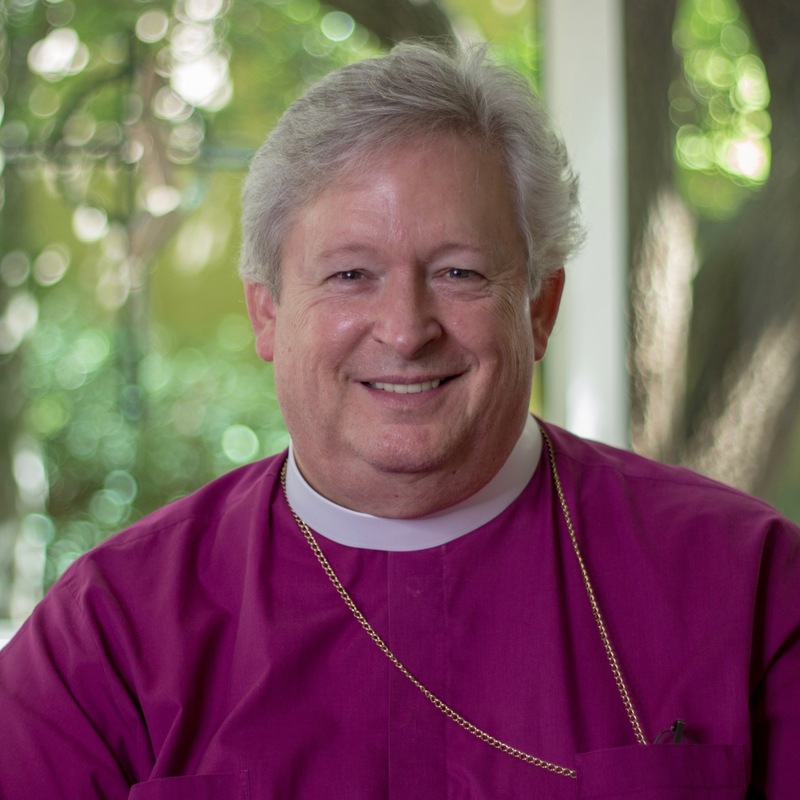 Cole served as the rector at the Episcopal Church of the Good Shepherd in Lexington, Kentucky, from 2012 until his election as bishop. The Rt. Rev. Samuel Rodman was ordained and consecrated as the 12th Bishop of the Episcopal Diocese of North Carolina July 15 at Duke University Chapel. He succeeds the Most Rev. Michael Curry, former bishop who was elected presiding bishop of the Episcopal Church at the 78th General Convention in 2015. About 1,000 people attended the service. He is pictured here (front row, third from left, with crozier), flanked by co-consecrating and attending bishops. Attendees at the June 7-9 Province IV Synod heard from some of the leading voices in the Province on the subject of "Sanctuary" and implications of immigrant safety as a result of new U.S. policies. Here, from left, The Rev. Dn. Juan Sandoval, Archdeacon of the Diocese of Atlanta; Joan Geiszler-Ludlum, Chancellor of the Diocese of East Carolina; and (standing at the podium) the Rt. Rev. Jose McLoughlin, bishop of the Diocese of Western North Carolina, lead the discussion. Province IV’s Youth Presence at General Convention later this month will be High Garth (Western North Carolina) and Levi Thompson (Louisiana). They flank Province IV’s Youth Ministries Coordinator Cookie Cantwell (East Carolina). 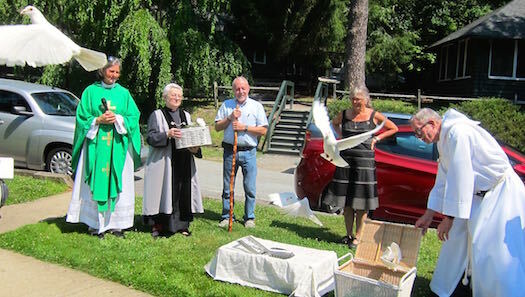 They were guests of the PIV Synod June 3-5 at Kanuga Conference Center, N.C.
At the close of the 25th HIV/AIDS Retreat at Kanuga, 26 mountain-bred white doves were released to symbolize the 25 years of of this ministry in Province IV, plus an additional dove representing the Holy Spirit. This is the last year of this retreat; ministry leaders hope the work will be revived in another new initiative in the Province in the coming year. The 25th and final HIV/AIDS Retreat ended June 12 with a closing Eucharist at the Chapel of the Transfiguration at Kanuga. Pictured here are, from left, Lola Thomas, chair of HIV/AIDS Ministries for Province IV; Trey Clegg of Atlanta, organist and choirmaster at St. Paul's Episcopal Church in Atlanta, music leader for the retreat; Angela Daniel, PIV President; the Rev. Marty Stebbens, rector of St. Timothy's Episcopal Church in Wilson, N.C., who celebrated at the closing Eucharist; Bruce Garner, retreat leader and longtime HIV/AIDS leader; and PIV Administrator Gene Willard. The Rt. Rev. 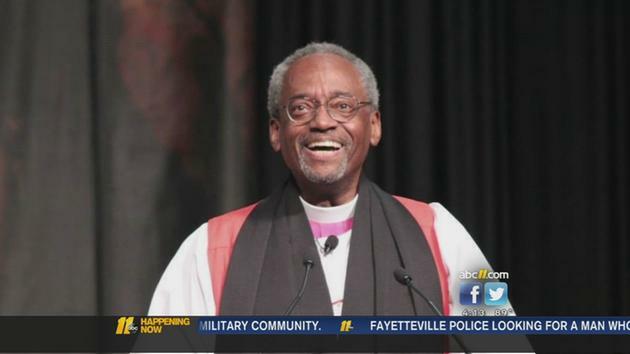 Michael B. Curry, bishop of the Diocese of North Carolina, has been elected the 27th Presiding Bishop of The Episcopal Church. 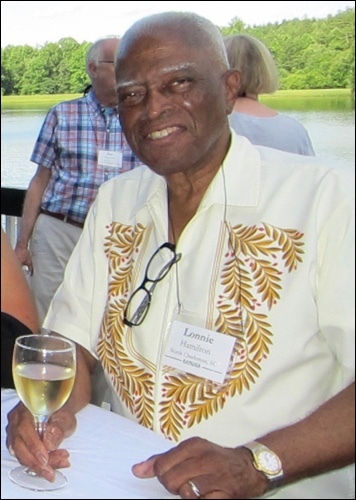 He will be installed Nov. 1 at the Washington National Cathedral. October 18, 2018 | The last edition of the Province IV newsletter, "Fourth Watch" is posted here.